As cell phones and other mobile electronics have become more integrated into the daily lives of Americans, our nation increasingly faces a serious public safety issue: distracted driving. This dangerous behavior has led to millions of car accidents around the country, and a number of organizations have launched campaigns to raise public awareness. Among those include the National Safety Council, which has designated each April as National Distracted Driving Awareness Month. If you or a loved one has been injured by a distracted driver, call Zinda Law Group at (800) 863-5312 for a free consultation with an experienced car accident attorney. According to the NSC, each year, this reckless behavior leads to some 1.6 million motor vehicle collisions, claiming the lives of nearly 3,500 individuals and injuring hundreds of thousands more. • Cognitive – Not paying attention to what you are doing. Texting while driving has become a particular concern because it encompasses each of those risky actions. Today, some 25 percent of automobile accidents involve texting behind the wheel, an activity that makes motorists six times more likely to crash than a drunk driver. Almost every state has passed a law that implements either a full or partial ban on using cell phones while driving, but it remains the responsibility of motorists to exercise common sense on the road. You should never handle a cell phone while driving, and in an emergency, pull over to a safe area on the side of the road or in a parking lot before talking or texting. Other activities that commonly distract motorists include eating and drinking, grooming, reading, adjusting the radio, and driving while tired. 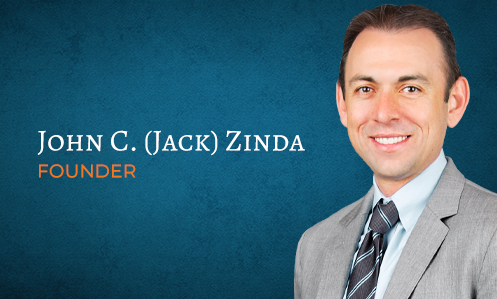 At Zinda Law Group, our knowledgeable car accident attorneys have helped thousands of individuals get their lives back on track after a car accident. We have the experience and resources necessary to help you build the strongest case possible and seek compensation for medical bills, property damage, lost income, pain and suffering, and much more. We also work on a contingency fee basis, which means you pay nothing unless we win your case. If you or a loved one has been injured in an automobile accident caused by a distracted driver, call the team of experienced personal injury attorneys at Zinda Law Group at 800-863-5312 for a free consultation about your case.